1. In which structure does double fertilization occur? 2. Mammals and sharks produce a compound called urea. What is the function of urea? A. It raises the pH level of the blood. B. It sends signals from cells that produce it to other organs. C. It provides energy to some cells and tissues. D. It prevents ammonia from building up in the body. E. It eliminates water from the bloodstream. 3. 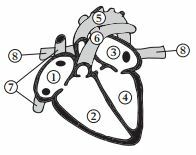 Deoxygenated blood is pumped to the lungs through which parts of the heart? 4. Which of the following characteristics of an allele is required for it to increase in a population through natural selection? A. Individuals with the allele are better able to find food. B. Individuals with the allele are better able to resist disease. C. Individuals with the allele have an increased ability to find and retain mates. D. Individuals with the allele produce more offspring that reach adulthood. E. Individuals with the allele have a longer lifespan than those without it. 5. Which of the following do animals and fungi have in common? 6. Which structure releases hormones that signal the tissue lining the uterus to thicken? 7. In what order did the following types of organisms appear in the history of life on Earth? 8. Which of the following is required for speciation to take place? 9. Which structure allows photosynthesis to begin in a germinating dicot plant? 11. The diagram shows a seed. What is the function of the structures indicated by the arrows? 12. Scientists examined the effects of adding nutrients to waters off the Eastern coast of the United States. The graph shows the nutrient added and the resulting algae counts at six locations. No nutrients were added in the control condition. Which location experienced the greatest increase in algae in response to the addition of phosphorus? 13. Scientists examined the effects of adding nutrients to waters off the Eastern coast of the United States. The graph shows the nutrient added and the resulting algae counts at six locations. No nutrients were added in the control condition. At which locations was a sufficient supply of phosphorus present before the experiment was conducted? 14. Scientists examined the effects of adding nutrients to waters off the Eastern coast of the United States. The graph shows the nutrient added and the resulting algae counts at six locations. No nutrients were added in the control condition. 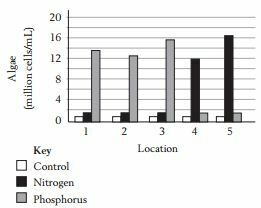 At which locations was nitrogen a limiting factor on algae growth? 15. Scientists examined the effects of adding nutrients to waters off the Eastern coast of the United States. The graph shows the nutrient added and the resulting algae counts at six locations. No nutrients were added in the control condition. Algae incorporate nitrogen and phosphorus compounds in the environment into which of the following macromolecules? 16. In fruit flies, normal-sized, solid-colored body and red eyes are wild- type (normal) traits. Flies can be assumed to have these traits unless otherwise stated. A geneticist crosses fruit flies from a strain with purple eyes and with fruit flies from a strain with dwarf bodies. The results of the F1 cross are shown below. The scientist then crosses F1 flies together. Results from the F2 generation are included in the table. 17. In fruit flies, normal-sized, solid-colored body and red eyes are wild- type (normal) traits. Flies can be assumed to have these traits unless otherwise stated. A geneticist crosses fruit flies from a strain with purple eyes and with fruit flies from a strain with dwarf bodies. The results of the F1 cross are shown below. The scientist then crosses F1 flies together. Results from the F2 generation are included in the table. 18. In fruit flies, normal-sized, solid-colored body and red eyes are wild- type (normal) traits. Flies can be assumed to have these traits unless otherwise stated. A geneticist crosses fruit flies from a strain with purple eyes and with fruit flies from a strain with dwarf bodies. The results of the F1 cross are shown below. The scientist then crosses F1 flies together. Results from the F2 generation are included in the table. 19. In fruit flies, normal-sized, solid-colored body and red eyes are wild- type (normal) traits. Flies can be assumed to have these traits unless otherwise stated. A geneticist crosses fruit flies from a strain with purple eyes and with fruit flies from a strain with dwarf bodies. The results of the F1 cross are shown below. The scientist then crosses F1 flies together. Results from the F2 generation are included in the table. 20. In fruit flies, normal-sized, solid-colored body and red eyes are wild- type (normal) traits. Flies can be assumed to have these traits unless otherwise stated. A geneticist crosses fruit flies from a strain with purple eyes and with fruit flies from a strain with dwarf bodies. The results of the F1 cross are shown below. The scientist then crosses F1 flies together. Results from the F2 generation are included in the table.